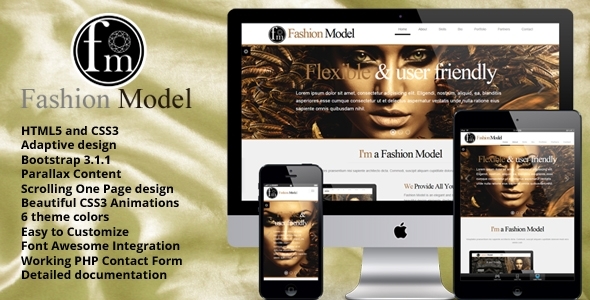 Fashion Model is an elegant and stylish onepage template with a focus on clean and beautiful design elements. Perfectly suits for models, freelancers and creative art persons as well.\\r\\n\\r\\nTheme Features:\\r\\n\\r\\n-HTML5 and CSS3 adaptive design based on Bootstrap 3.1.1\\r\\n-Parallax Content\\r\\n-Scrolling One Page design\\r\\n-Beautiful CSS3 Animations\\r\\n-6 theme colors\\r\\n-Responsive Design\\r\\n-Cross-Browser\\r\\n-Easy to Customize\\r\\n-Font Awesome Integration\\r\\n-Working PHP Contact Form\\r\\n-Detailed documentation included\\r\\n\\r\\nFor 24/7 support please write to artlabor@artlabor.ee (along with Purchase Code).\\r\\n\\r\\nLive preview images are from Shutterstok.\\r\\nImages is NOT included via download pack. In download pack is included placeholder images for each instance. Do you have any comment or questions about artlabor file?